We have presented the solution of Virtual Fitting Room of the young Russian company Fitting Reality. Irina Kharseeva has spent time in his overbooked schedules for answer to your questions. RA’pro : Can you quickly introduce yourself and describe your background? Irina Kharseeva : My name is Irina. I currently head the PR department at Fitting Reality. I would like to add that we have a very skilled team. The team has a solid background in programming (C++, GPU programming), game development, augmented reality, fashion and marketing. Having such a team helped us to develop a well-thought strategy for further development and expansion. RA’pro : Fitting Reality is very young compagny, can you make a presentation about it? Irina : You are right. It is a young company. 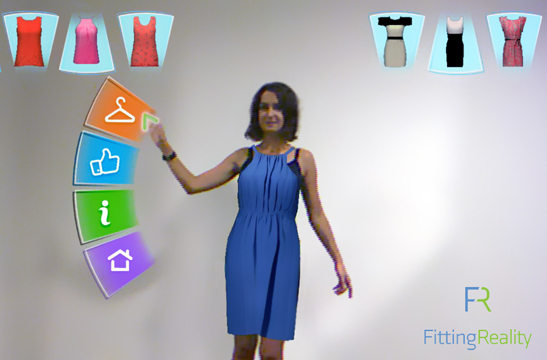 The company was founded in 2011 with a main focus on developing an advanced augmented reality fitting room to make life much easier for shoppers and more rewarding for retailers. RA’pro : Who are the co-founder of Fitting Reality ? Irina : There are three founders of the company: Lev Razumovskiy, Boris Onikul, Inga Nakhmanson. Inga is also the CEO of the company. RA’pro : what is your business model? Irina : The VIPodium is financed by commercials. The payment method is similar to contextual advertising based on a pay-per-view principle. To enter the network the brand is required to pay a membership fee. RA’pro : I already saw some demonstration of the Virtual Fitting Room but the presentation you did at the exhibition is very wonderful and amazing. Could you, please, explain the Genesis of this project? Irina : Thank you very much! This is how the product was born. The idea of starting a company came to Inga Nakhmanson (CEO) when she was desperately trying to find a dress for her friend’s upcoming wedding. She had several options: either to spend the whole day in a mall hunting in each and every department, struggling for free parking lot, and spending most of the time in long lines, or shop online hoping the delivered item would be of the right size and style. She also has a child, 5 years old. That’s why she could not allow herself spend a lot of time on shopping. Rather than compromising on shopping, she began thinking about a service or platform that could allow anyone to go shopping without that compromise and additionally save a lot of time. Hence the VIPodium was born. She then searched the internet to see if something similar existed. The systems she found were poor quality and primarily designed to entertain the customer. Instead, Inga wanted to create a platform that would help people easily and quickly navigate through a limitless number of garments; a system that would make people confident in their purchase decisions even without the need of physically trying on the clothes. Inga realized that there is some business opportunity there. She sketched out a business plan. She had previous experience in augmented reality, so she knew how things work. To make her idea come true she recruited a well-skilled team that is now working hard to make out of her idea a topnotch system of virtual fitting room. RA’pro : how your solution is seen by the designers and the major clothing brands? Irina : They are very curious about the technology! Since the presentation of the product at DEMO we have received a lot of attention from the journalists and retailers as well. We are still working on VIPodium’s improvement. We are conducting a series of surveys among retailers and shoppers. We hope that the feedback they provide will help us to create an advanced retail solution. Here I would like to invite professionals in fashion business, designers, retailers, store design managers, brand executives to take part in our online survey. Please, feel free to contact me if you you wish to participate. RA’pro : who will model the clothes? RA’pro : Can you explain what kind of hardware do need for use your solution? Irina : VIPodium can be used either in-store or at a comfort of home. Basically we need three key elements: a computer to run the software, a screen and a motion sensor. RA’pro : A motion sensor like a Microsoft Kinect? Irina : To work with our system a person can use different types of motions sensors. Kinect or a similar sensor from Asus, for example. RA’pro : Have you tested your solution in “real condition”? And what are the feedback of the users? Irina : This is what we are doing right now. We are testing the product in Europe, North America and Asia. The scope of research includes ethnographic observations, home visits and interviews. Later on we will be able to tell the results. Their feedback will be used in further development of the system. RA’pro : Many thanks for this conversation, we appreciate you can take time to answer our questions. We will follow with a great interest a progession of your solution.